Want a cool Instagram Feed? It is your day of the month to use the Media Kitchen at the Food Tech Campus! It includes the use of the event kitchen for the preparation & staging of products as well as the use of studio light, backdrops, professional SLR camera, various backgrounds & various props. Kfir Harbi is a specialized photographer and filmmaker in the food and beverage industry. Nestle, Heinz, Sauter, Unilever, Nespresso, Lotus, and many other small local brands and restaurants. 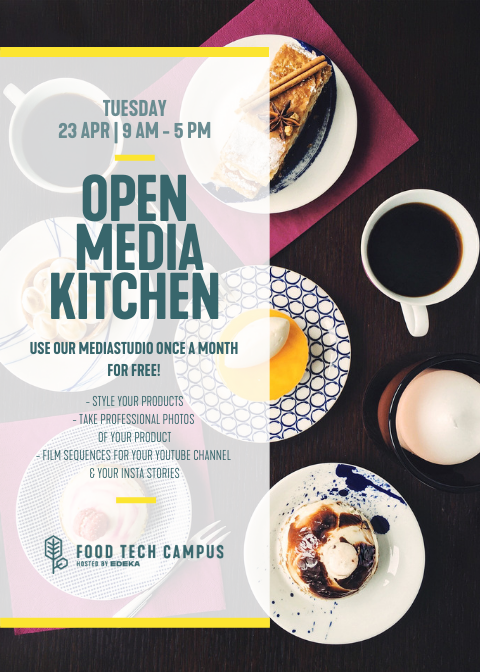 Kfir and his team which are new members of Food Tech Campus, will be glad to help you to be prepared for the next Open Media Kitchen day and to plan your visuals right to get the maximum results out of this day. Don´t hesitate to write us or catch us in the campus.